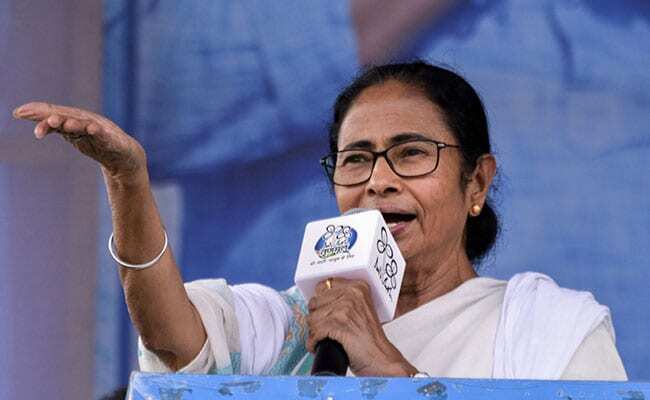 Mamata Banerjee accused Prime Minister Narendra Modi of being a fascist, for unleashing a reign of fear and trying to threaten parties opposed to him. Trinamool Congress supremo and West Bengal Chief Minister Mamata Banerjee on Wednesday came out in support of DMK leader Kanimozhi, whose residence was searched by central agencies. Ms Banerjee accused Prime Minister Narendra Modi of being a fascist, for unleashing a reign of fear and trying to threaten parties opposed to him. Kanimozhi is being harassed as DMK is opposed to BJP's divisive politics in south India, she told at a poll rally at Kandi in Murshidabad district. Charging PM Modi with ruling the country by "unleashing a reign of fear", Ms Banerjee said that the country has never seen a prime minister like PM Modi who is feared by everyone "instead of being loved and respected". "It is a shame that BJP is using central agencies against opposition leaders and parties to harass them. Yesterday the Income Tax(department) without any reason raided Kanimozhi's house. Just because DMK and its leader MK Stalin are opposed to Narendra Modi and BJP, they (DMK leaders) are being unneccessarily harrassed," Ms Banerjee said. Election officials assisted by those from the I-T department on Tuesday searched the Kanimozhi's residence at Tuticorin in Tamil Nadu from where she is contesting. DMK president MK Stalin in a statement said the raids were an outcome of "fear of a damning defeat" for BJP's candidate Tamilisai Soundararajan in Tuticorin. "For us a leader is a person who is loved and respected by people from various sections of the society. But for the first time since Independence, we have a leader like the prime minister who is ruling the country by a reign of fear. We have never seen such a fascist prime minister who is ruling like Hitler," Ms Banerjee said. She alleged that "Modi is threatening everybody and everybody is afraid of him ... It is a shame that a person who was baptized in politics through riots is leading the country". Addressing another rally at Raghunathganj in the same district, Ms Banerjee reiterated her charge against BJP that it is trying to gain political mileage by playing the religion card. "The BJP is trying to divide the people in the name of religion. They are using it as a tool to divide the masses in Bengal ahead of the Lok Sabha polls. The culture of Bengal never supports the politics of violence," she said. The combative leader continued "I too am a Hindu - but Hindus don't believe in creating divisions among the people or inciting violence. Hinduism believes in creating unity by respecting other religious beliefs and in staying together in harmony". Opposing BJP's stand on implementing NRC in the country, Ms Banerjee said she would not allow it in West Bengal. "We will never allow NRC in Bengal. They (BJP) are saying that they are bothered about Hindus. Names of around 22 lakh Hindu Bengalis have been removed from the list of citizens in Assam. Is this the concern BJP has for Bengalis?," she asked. The Citizenship Bill, she alleged, will make a resident a foreigner for six years and will then be considered for citizenship. "It will rob us of our rights and our livelihoods," she claimed. Reiterating her charge that Congress is taking help from RSS to win elections in West Bengal, Ms Banerjee alleged that the RSS is campaigning Abhijit Mukherjee, the son of former president Pranab Mukherjee, who is contesting from Jangipur and for Adhir Chowdhury at Baharampore. CPI(M), she said, has already sold out to BJP. "During day time they are behaving like Congress leaders, in the afternoon they are CPI(M) cadres and in the night they are acting as BJP cadres. You should not cast a single vote in their favour. You should defeat them". Ms Banerjee expressed happiness that many workers and leaders of the Congress and CPI(M) have joined TMC and said they have realised how their erstwhile parties had sold themselves. Claiming that the BJP-led NDA government at the Centre has worked against the interest of the people of the country, she said that prices of petroleum products increasing everyday when crude oil rates were low in the international market. "For the last five years they (BJP government at the Centre) have been increasing oil prices but just ahead of elections they will take decrease the prices by Re 1 to Rs 2 and take credit for it," she said. Maintaining that demonetisation is a scam and has been a disaster for the country, the TMC supremo said two crore youth have lost their jobs in the country.